It’s Left-Handers Day! Who knew? In honor of Left-Handers everywhere, I though it more than appropriate to share my Quick Pickle recipe. Namely because when I photographed them, I didn’t realize me recent left-handedness was glaringly obvious. Can’t you tell? with your left hand means reading the metric measurements. Such is the plight of left-handers. 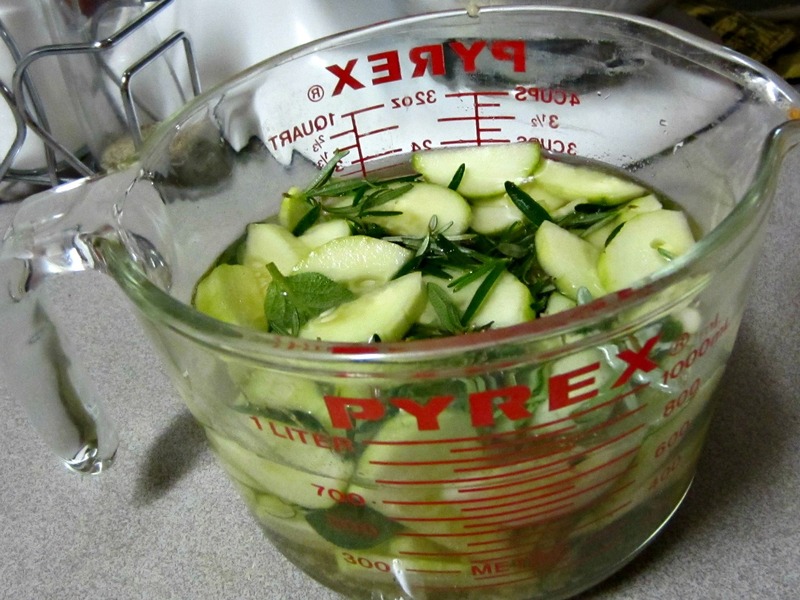 to measure anything… just to hold my cucumbers and herbs to make yummuy pickles! I had always thought that pickles were something that HAD sit in a brine in a jar for a long time in order to “pickle”. But after watching episodes of Chopped, and hearing many constant chefs make “a quick pickle” out of the veggies in their basket, I realized there is another way! So, these pickles came out of a need to use up a cucumber while it was still edible. I had also recently rescued a little sage plant from the clearance table at the grocery store. And we have a monster of a rosemary plant growing in the backyard. The original recipe I found at Mother Earth Living called for a thinly sliced onion. I did not have an onion. I persevered. The results were pretty tasty as a snack on their own. I also diced a handful and used the resulting “relish” on a burger. THAT was very good. Slice cucumber into ¼-inch rounds. Stack cucumbers and herbs in a container of your choice. Combine vinegar and salt in a saucepan. Bring to a simmer and gently stir until salt dissolves. Remove from heat. Add cold water to this mixture and let cool. Pour cooled liquid in jar to cover cucumbers and herbs. Add more cold water if necessary. Leave room at the top. Refrigerate for about an hour until chilled. Previous Post: « Penguin Push Pins FTW!